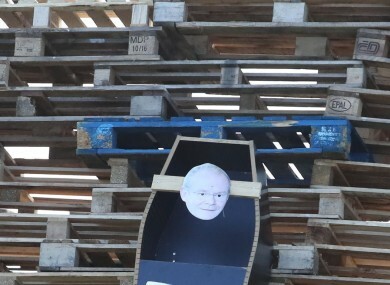 AHEAD OF TWELFTH of July celebrations among the Protestant community across Northern Ireland tomorrow, one bonfire prepared in east Belfast was spotted bearing a coffin with an effigy of Martin McGuinness on it this evening. Fires will be lit in loyalist areas across the North this evening as protestants usher in the main date of the parading season. This particular bonfire was spotted on Clonduff Road. Earlier today, Sinn Féin general election candidate John Finucane reported a hate crime to police after posters from his campaign were at the top a bonfire due to be lit in Belfast. Sinn Féin national chairperson Declan Kearney called the McGuinness display “a particularly sickening manifestation of hate”. “It is also grossly insulting to the McGuinness family which still mourns the loss of a much loved father, brother and grandfather,” he said. He urged unionist parties to condemn the display and other such examples. In a statement this evening, DUP leader Arlene Foster urged those who build bonfires to “not play into the hands of those who want to demonise [their] culture”. This morning, Finucane, the son of murdered human rights lawyer Pat Finucane, shared a photo from one bonfire site which showed several of his posters had been attached to pallets. Posters from two other candidates have also been placed on the bonfire, as well as a flag for the Islamic State terrorist group. Finucane said he has reported the incident to police. Email “Coffin with effigy of Martin McGuinness on loyalist bonfire in east Belfast”. Feedback on “Coffin with effigy of Martin McGuinness on loyalist bonfire in east Belfast”.